Join me on Sunday June 7 from 2 – 4pm, as I celebrate the appearance of my exhibition, Lions, Livestock & Living Walls, on Long Island. 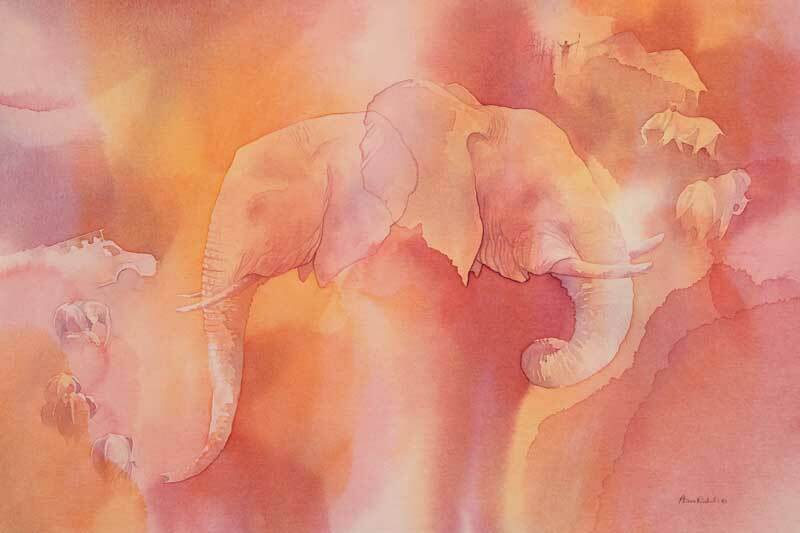 You can see my watercolor field sketches and studio acrylic paintings, based on my visits to the African People & Wildlife Fund in Tanzania. You’ll also be able to see my new book, and at 3pm hear me talk briefly about APW and my visits there. So please join me at the wonderful Cold Spring Harbor Library on Sunday June 7, from 2 – 4pm. The exhibition will be on display from June 2 – July 30. A donation will be made to APW from every sale. You can find the Cold Spring Harbor Library opening times here. This entry was posted in African People, African Wildlife, Blog Posts, Conservation, For Artists and tagged maasai, tanzania on May 6, 2015 by Alison. Shimmer & Shukas was painted during a day-long Maasai ceremony in Loibor Siret, northern Tanzania. The women were dazzling in their vibrant shukas, covered with beaded necklaces, headbands, earrings, arm & ankle bracelets. As usual, I started my sketch with a very light pencil drawing and then, a couple of hours later, while the ceremony continued around me, I added the watercolor. The ceremony itself was for a group of moran (warriors), who were embarking on the long process of becoming elders. The men had just finished drinking calabashes of milk and a slight halt was called in the proceedings while the cows headed out to pasture. I had asked permission to sketch and saw this group of women nearby, so I began. 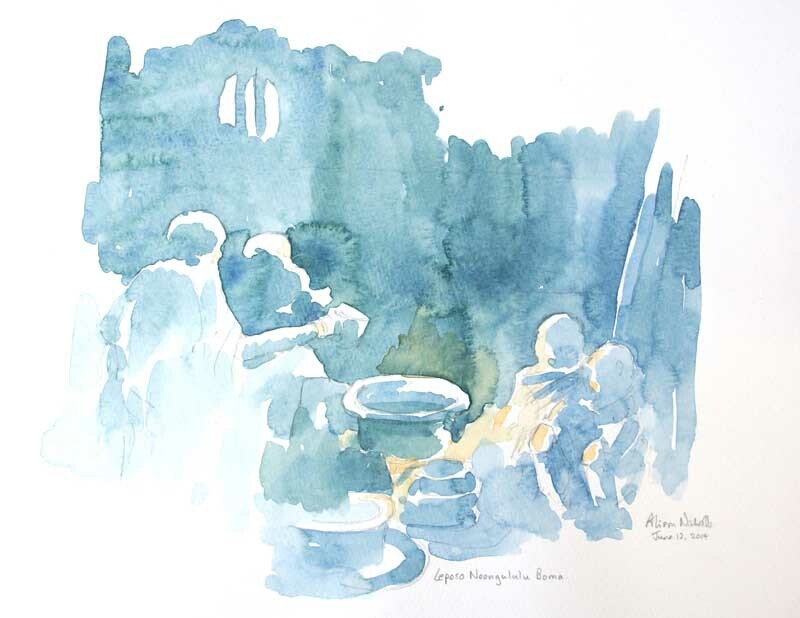 Their beaded jewelry is mostly white, with areas of blue & yellow, while small metal disks on thin chains hang from almost every piece – hence the “shimmer” in the title of the sketch. Painting white beads and shiny metal disks on white paper can be a challenge, so I didn’t paint them, instead I painted around them, using the colors of the dark skin and bright shukas to define the jewelry. 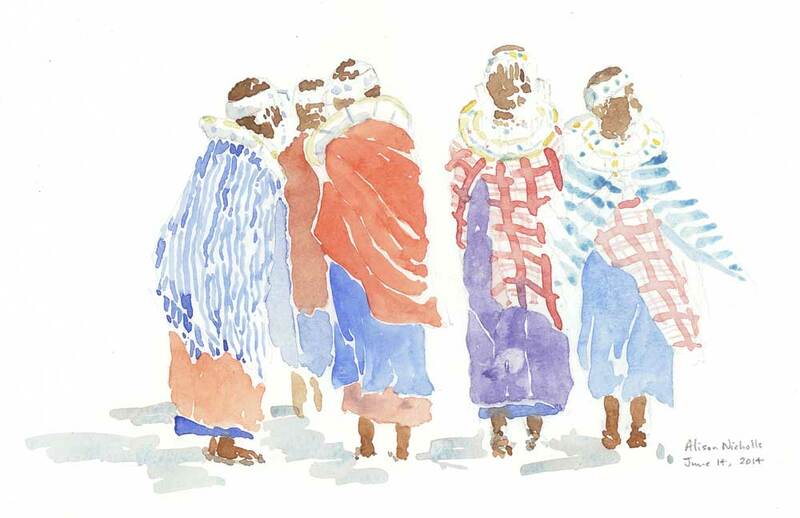 So why was I sketching in a Maasai engang (homestead) in Tanzania? Because I was revisiting the African People & Wildlife Fund (APW), an organization I have been supporting for several years now. APW has created numerous positive benefits for communities on the Maasai Steppe. Local children have the opportunity to attend an environmental summercamp and receive a scholarship for high school education. 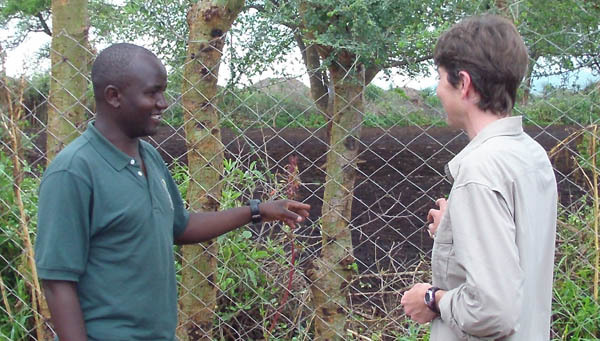 Human-wildlife conflict has been reduced by the innovative Living Walls program. Women’s groups can apply for grants to start a small business. The community has asked APW for, and received, data and environmental education, allowing them to make good long-term decisions about their land and water use. APW’s impact has been possible due to the creation of a permanent base in the area and their close links with local communities, who provide the vast majority of their staff. Perhaps the most wonderful thing for me, was to be remembered by some of these friendly and welcoming people from my previous visits. They encouraged me to sketch and were always interested in seeing my work. I will be sending copies of my sketches back to APW so they can be given to all the people who were in them. Next week I’ll show you video of my work at the Loibor Siret school, but in the meantime I’d like to thank Dr Laly Lichtenfeld and Charles Trout for inviting me to return to Noloholo, and all the APW staff, particularly Joyce Ndakaru, for their help and support. Asanteni sana! Learn more about the valuable work of the African People & Wildlife Fund on the Maasai Steppe in Tanzania. Shimmer & Shukas. 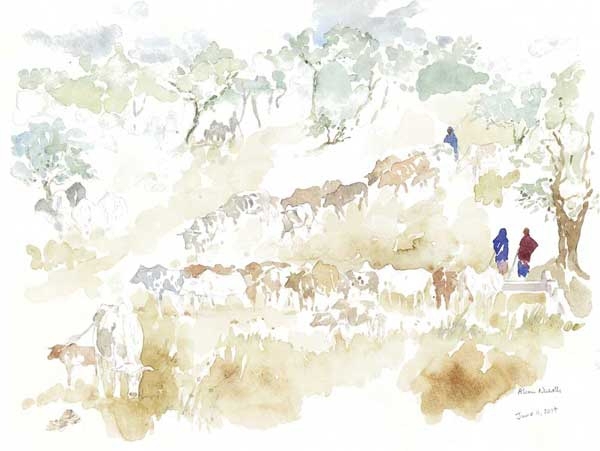 Field Sketch from Tanzania by Artist Alison Nicholls. Every month I’ll write a post about the piece of art I am currently working on and I’ll show you an image or two. It would have been so much more elegant to call this monthly post “What’s on my easel?” but I work flat on a table, and ‘What’s on my Table” really doesn’t have an artistic ring to it, does it? So we will continue with “What am I working on”. At the moment I’m working on a piece which will probably be titled “Living Walls in Tanzania”. It is another in my series of conservation-themed paintings and illustrates how the African People & Wildlife Fund in Tanzania are helping protect livestock, predators and habitat with their popular ‘Living Walls’. In a nutshell, this is a program which helps Maasai families build stronger, maintenance-free bomas by using wire interspersed with living fenceposts of various Commiphora species (local trees). The use of a ‘living wall’ which grows around the wire eliminates the need to keep cutting fresh thorny brush to rebuild the boma every few months. The stronger boma prevents livestock being killed by predators at night, and the fact that predators are not killing livestock means retaliatory killing of predators is reduced. Clever. But complicated. The Living Wall has so many impacts on people, their livelihood, the habitat and wildlife species. And putting this in a painting is proving to be equally complicated. The drawing above is a detail from the full piece, showing the wire of the fence, a predator (spotted hyena), livestock (a goat) and one of the living Commiphora fenceposts. A pencil drawing makes it look simpler than it will be once color is added to the equation. And that’s what comes next…lets hope my painting is as successful as the Living Walls program!